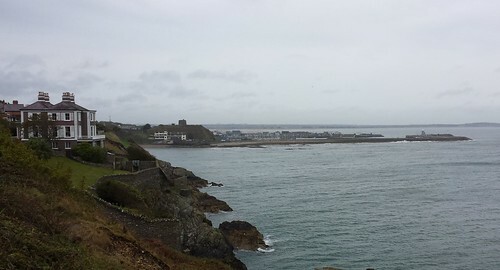 Sandy and I celebrated our 30th wedding anniversary by going to England, with a stopover in Dublin for one night on the way there and one night on the way back. 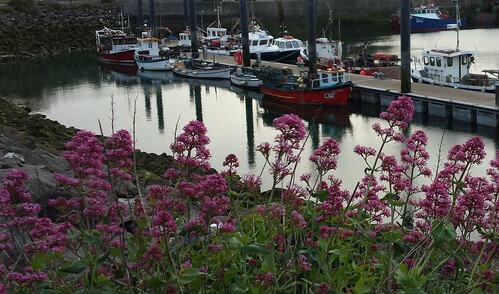 When we got a good deal on airfare from Hopper, it included a 7 hour layover at Dublin Airport, which was of course was too short to do anything fun, so I booked a B&B in Howth, Dublin, not too far from the airport, and we flew to London the following day for about as much as it would have been anyway. 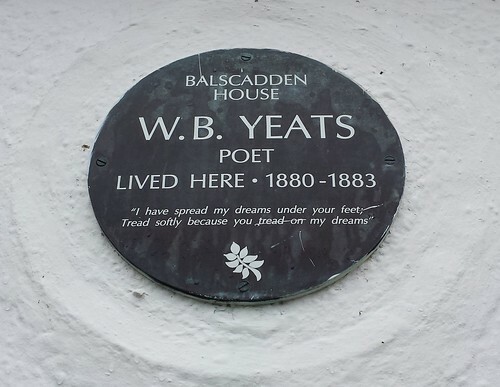 Besides, you know how we love Ireland, how could we resist? That part is a bit interesting because when we got to Raleigh Durham airport around 4 p.m. on Saturday, May 13, the people at the Jet Blue counter informed us that our flight had been delayed from JFK, and that was a common occurrence in the late afternoon at JFK, and that we probably wouldn’t have made our connection anyway. So they rerouted our flight through Boston and London, giving us the option of getting off in London where we were headed in the first place. 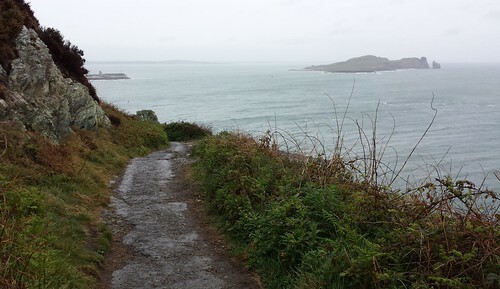 But it was too late to cancel the room in Howth, and it didn’t take long to make the decision that even though it would be a longer flight, we wanted to go to Ireland first. The Jet Blue staff put us in upgraded seats and I have now officially become a fan of Jet Blue and may switch my points card over to them from Southwest once I get my travel done for this year. The other takeaway was to avoid JFK like the plague if at all possible. We knew that we would be exhausted on the first day. Sitting for more than an hour causes me a lot of pain and I couldn’t sleep. The British Airways flight from Boston to London was okay. We were served a meal around 11 p.m. with wine and I recall that the food wasn’t bad, although even I knew that the wine was shite. 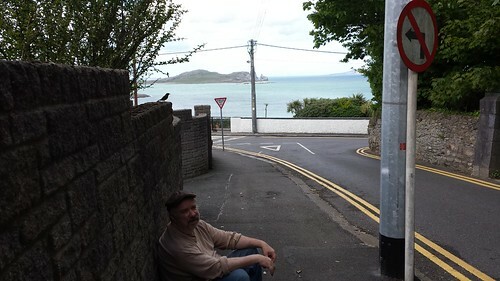 We got to Dublin around noon on Sunday, May 14, where we took a long meandering bus ride to Sutton, got on the DART train to Howth, and found ourselves in a crowded seaside town with no phone service or wifi, and relying on my memory of the map and address of the B&B. The tourist information kiosk was no help. No one we asked knew where Kilrock Road was, or maybe they didn’t understand our accents. There was a jolly man who was driving a little tourist “train” up and down the main drag who gave us a ride as far in that direction as he went for free, and I bless him for that. 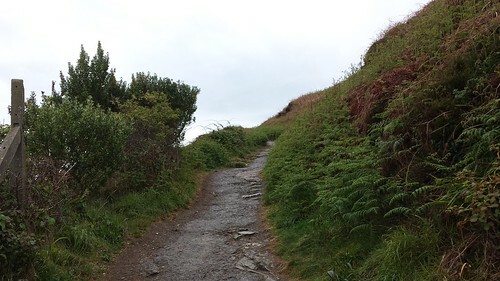 It was about 3 p.m., the B&B was locked, and I sat down on my backpack and wept. Fortunately Sean had just stepped out quickly, and he turned out to be one of the nicest, most helpful people on our journey. He got us into a very comfortable room where we both crashed for about 3-4 hours. 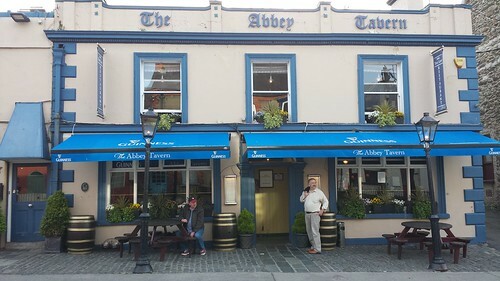 Then Sean drove us down the street to the Abbey Tavern for dinner, where I had “fisherman’s pie” and an Irish red ale. 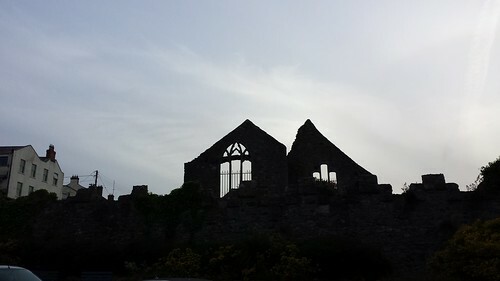 We walked past the abbey ruins back down to the harbour at sunset, where the weekend crowd had gone home. 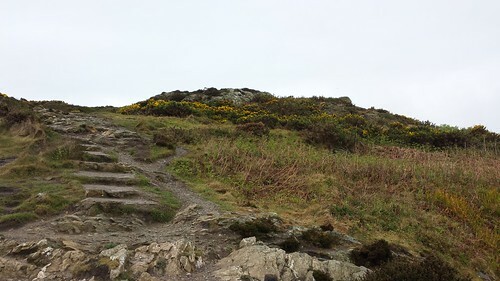 We took a cab back up the hill for the short ride to the B&B – it turned out that there was a shorter, less strenuous ascent, but we were still too whupped to do it. The next morning, Sean served the guests an insanely delicious full breakfast and we chatted with a German couple about our plans and our favorite travels so far. We asked Sean about a cab to the airport and he offered to drive us! Then, when I got ready to pay him for our night’s stay, it turned out that he didn’t take credit cards and I didn’t have the cash. We offered to go to an ATM, but he insisted that we seemed like honest sorts and that he’d get the payment from us on our way back through in two weeks. 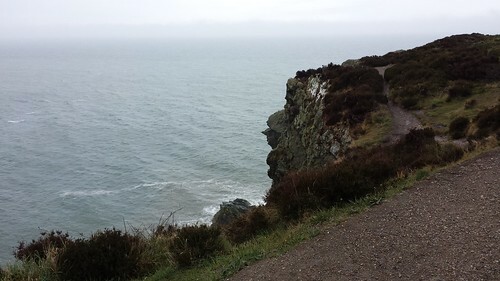 I decided to take a misty walk up the Howth Cliff Path until Sean was ready, part of which we had walked on our first journey into town. 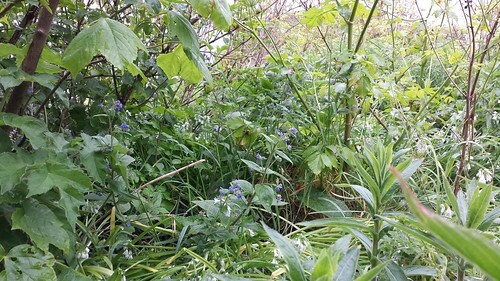 May is an excellent time for wildflowers in the British Isles.